Home » Mazda CX-3 » Have You Seen the Brand-New 2019 Mazda CX-3? Have You Seen the Brand-New 2019 Mazda CX-3? Have you heard the good news? Mazda has just had the world premiere of their newest model, the 2019 Mazda CX-3! This is the first 2019 Mazda model to be announced for this year! As always, a new year model brings new enhancements and improvements over its previous models. Therefore, how does the 2019 Mazda CX-3 compare? 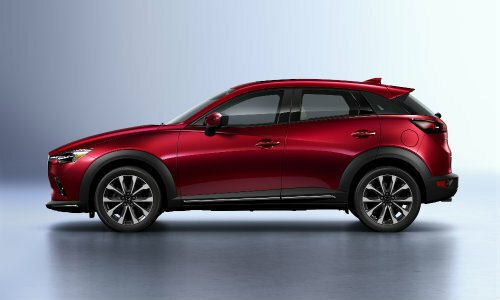 Taking a look at the information from the New York International Auto Show, we’ll see how the 2019 Mazda CX-3 improves upon the 2018 Mazda CX-3! For a more comprehensive and detailed listing of features from the New York International Auto Show announcement and premiere, please follow the link here. When Can I Get the 2019 Mazda CX-3? The 2019 Mazda CX-3 is set to be released in the spring of 2018. Your first thought reading that last sentence is probably to acknowledge that it’s already April of 2018. That’s true. Therefore, you should likely expect the 2019 Mazda CX-3 to hits stores in May. However, it might possibly be pushed to June at the latest as long as there are no delays that cause Mazda to announce a new timeline. Does the 2018 Mazda CX-3 or the 2018 Mazda 6 Have More Cargo Space? To be informed of any further updates regarding the 2019 Mazda CX-3, please contact us here at Marketplace Mazda. Our sales team is dedicated to bringing you the very best in terms of service. We’ll make sure to keep you up to date on the latest Mazda news. You can reach our staff by phone or at our dealership in Rochester, New York within Monroe County. We’re also eagerly awaiting the release of the 2018 Mazda CX-3! This entry was posted on Monday, April 2nd, 2018 at 3:22 pm	and is filed under Mazda CX-3, New Vehicles. You can follow any responses to this entry through the RSS 2.0 feed. You can skip to the end and leave a response. Pinging is currently not allowed.